WASHINGTON — The next time you’re at the post office, take a look at the pen you’re handed to sign for your package. Or if you work in a government office or at the Pentagon, crack open practically any desk drawer. 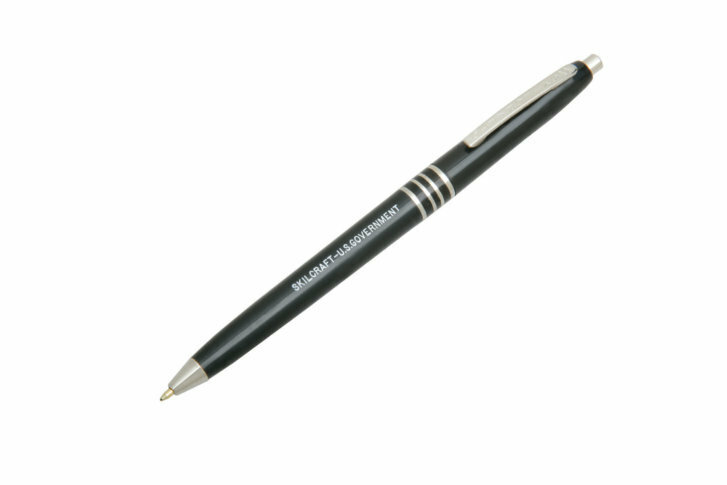 That slightly smaller-than-average pen, encased in a black tube, with the words “SKILCRAFT – U.S. GOVERNMENT” engraved across the side, may look like your basic ballpoint. But appearances can be deceiving. First manufactured in the 1960s, according to highly detailed government and military specifications, the pen was designed to write without fail in office cubicles and war zones, alike. (An example of those specs: A single pen was required to be able to write a linear mile before needing an ink refill and had to be able to withstand extreme temperatures). Skilcraft pens are notable for another reason. For the past 50 years, they have been produced by sight-impaired workers under an 80-year-old program dating to the New Deal to employ blind Americans. “There is lots of history in this particular pen,” said Kevin Lynch, CEO of the National Industries for the Blind, the Alexandria, Virginia-based company that oversees production of the pen. The company recently marked 50 years since the first pens rolled off the production line. Over the years, the pens have also been the subject of some interesting bits of military folklore, according to Richard Oliver, the company’s director of community relations who works out of its Greensboro, North Carolina, manufacturing facility. Like what? Let’s just say the pens have been rumored to serve as emergency in-field medical equipment at times. The Skilcraft pen was born in a bygone age, largely before the government bought commercial products to stock its office supply closets. The pen barrels had to withstand temperatures as extreme as a North Pole winter and a Death Valley summer — from negative 40 degrees Fahrenheit to 160 degrees. The pens had to write for nearly a linear mile — about 5,000 feet of paper — before the ink cartridge needed to be refilled. The ink had to dry within five seconds and be guaranteed not to smear or blot. Printed on paper, the ink had to withstand being submerged underwater for 48 hours and two doses of chemical bleach. Many of the specifications stem from their planned use in the military. For example, the pen’s unusually slight size — 5 and 1/8 inches long — meant they were small enough to fit completely into the pockets of most military uniforms, Oliver said, without the metal clip sticking out and potentially reflecting the sun, which could expose a soldier’s position to the enemy. “I think it was very important that the pen be able to perform,” Lynch said. The company said the pens have been used in every U.S. conflict since Vietnam. As the government began buying more commercial products over the years, the military-grade requirements mostly fell by the wayside. But the company says the instantly recognizable pens are still largely made the same as they were half a century ago. The pen’s length equates to 150 nautical miles on most maps, so Navy sailor can easily use it to measure distances. The bottom part of the barrel is also reportedly the exact length of a 2-minute fuse. Female sailors have used the tip of the pen to make sure their fingernails stay within the 1-quarter-inch regulations, according to a 2010 letter to the editor in the military newspaper, Stars and Stripes. And, yes, according to the lore, Navy medics have used the pen barrels to perform emergency tracheotomies. Famed for their no-frills exterior and satisfying clickability, in recent years, the pens have begun to gather fans outside the cloistered halls of government. They’ve inspired YouTube videos, adoring Pinterest pages, Twitter shout-outs — and even acted as muse to the poets. What explains the appeal of this humble pen? “I think it brings back memories for people, quite frankly,” Oliver said. And, according to pen fanatics, they write well and are inexpensive. Each year, several dozen workers crank out about 8 million pens, Lynch said. The pens are sold to the government under the AbilityOne program, which helps ensure some federal contracting dollars go toward companies that employ the disabled. You can score your own box, too. The pens retail for $6.87 a dozen — about 57 cents per pen — on the AbilityOne website. While the site is primarily geared toward government buyers, private citizens who create a login can make purchases, too, Lynch assured. Beyond the nostalgia factor and their newfound internet fame, the pens remain a source of pride for the workers who produce them. The unemployment rate for working-age blind Americans is about 70 percent. Overall, National Industries for the Blind and the various nonprofits that fall under its umbrella employs more than 5,600 people across the country. In addition to the “government pen,” the company makes scores of other types of pens and other office supplies, such as folders, calendars, dry-erase boards and staplers.